DETROIT -- Ford Motor Co. is buying an electric scooter company called Spin, the automaker said Thursday, in a bid to expand its mobility offerings and reach consumers who need short-distance transportation solutions. Ford said the scooters will roll out in 100 cities over the next 18 months, including a Thursday launch here. "We understand mobility is not just vehicles at this point," Sunny Madra, vice president of Ford's mobility incubator, Ford X, told Automotive News. "This is our play in addressing the micromobility business." News of the acquisition comes a week after crosstown rival General Motors said it would launch a new brand and lineup of electrified bicycles in 2019. Ford also offers bicycles through Ford GoBike, a West Coast bike rental service. Ford did not reveal the purchase price for Spin. Axios, which reported the deal Wednesday afternoon, described it as being around $100 million, citing two sources. Originally, the report put the deal at about $40 million. Dockless electric scooters have exploded in popularity in cities across the U.S. in recent months. Customers can download an app, locate a scooter, scan a code and ride. Prices are typically $1 to unlock a scooter and 15 cents per minute of usage. Scooter startups, including Lime and Bird, have said customers have taken 10 million rides in less than a year. By comparison, Madra said it took Uber three years to reach 3 million rides. "That showed us there was a significant market," said Madra, who came to the company from Autonomic, a startup that Ford Smart Mobility bought in January. "It became obvious to us we wanted to accelerate in this space." Ford partnered with Purdue University this year to offer electric scooters as part of a research project designed to determine how best to launch them in different communities. Critics of the services argue some companies dump hundreds of scooters in a city without getting permission from local governments. Spin, which launched its scooter service in February, has operations in 13 cities and campuses across the U.S. Madra said the company has made a point to engage with every city before it launches, which was a big reason Ford chose it. "They do not launch without permission; they share usage data with cities; and they work with local officials and university campuses to design educational tools around parking and riding rules," Madra said in a blog post expected to go up Thursday. "This approach aligns well with our values at Ford and with our ambition to be the world's most trusted company." 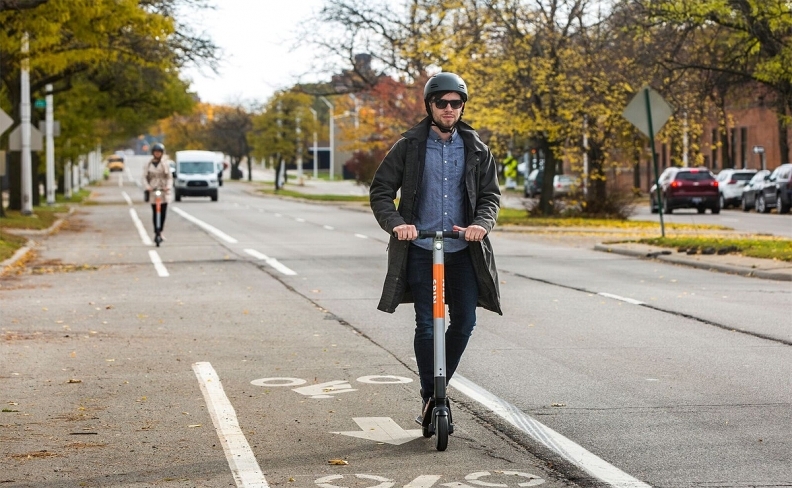 The amount of scooters available in each city will vary; Detroit, for example, limits companies to 400 each. Ford plans to keep the Spin name and doesn't expect to put any of the automaker's branding on the scooters, Madra said. He declined to say whether Ford expects the business to be profitable, saying only that the company thinks "it represents a healthy business for us."